A unique combination of sleek smoothness and cushioned comfort, the Mallory Sofa makes a statement with its slanting silhouette that seems to convey a sense creative movement. Expertly upholstered complete with meticulous tufting detail, the Mallory Sofa is available in your choice of lush yet rugged faux leather hues. Bench-made by skilled craftsman of durable materials. Upholstered in your choice of tan or gray soft, vintage-looking faux leather. Tufting details add textural appeal. Your choice of bold yet neutral hues. Sofa legs are angled to create a unique look. The legs and the way they work the shape of the design was the highlight of this sofa for me, a real pleasure to own! Love the color! Happy with my purchase!! Went with dark gray. Absolutely in love with the base!! It's so unique!! I've gotten so many compliments and bragged about it to all my friends. Couldn't be happier. I ordered this over the phone with customer service in the tan color. Inmod customer service rocks. Really really loving the angled legs on this sofa. Fits great and looks great too. Didn't expect to come across something and fall in love so fast, but I'm glad I did. Will definitely be back for more stuff! Perfect addition to my new family room. We recently renovated a room in our home with me doing the work and my wife doing the decorating. We tried to agree on furniture and I realized that I was not going to win. However, I did! She showed me this sofa in the vintage tan color and I liked it from the start. Once it was delivered and put into place, I was very happy with her choice. When will the sofa be available is fabric? I love it but I wont do faux leather. Good news! This sofa is already available in a fabric version. You can see it by going to this link: https://www.inmod.com/charlotte-sofa.html . It is called the Charlotte Sofa. What is the warranty on the faux leather against cracking or peeling? 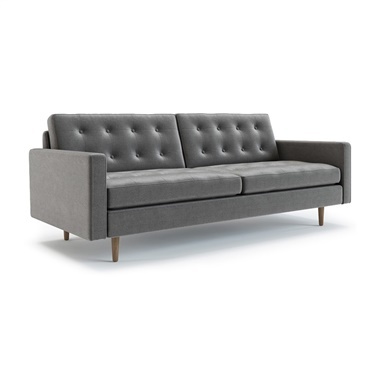 The Mallory Sofa comes with a one year manufacturer's warranty against any quality defects. do you have fabric samples? The faux leather is a PU (polyurethane).